The Archival Methods Metal Edge Short Top Box are often called as "Archival Shoe Boxes". The style box is a general purpose container for safely storing and protecting post cards and photographic prints. They are also commonly used for storage of small specimens such as mineral samples. The short top boxes have removable, close-fitted tops to seal out dust and insects. 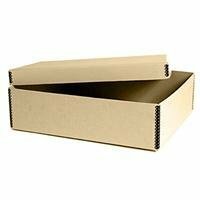 Short top boxes are manufactured from .040 and .060 tan-finished, acid- and lignin-free Archival Grade boxboard. Clamps provide rigidity and high stacking strength.